Purple firefish, pink spot watchman goby, and a Midas blenny is what I have with my clowns in a 54 gallon. I have a 50 gallon tank, a clown, baggai cardnal, flame angel, a lubbock wrasse, purple firefish and a regular firefish. Think it's best to add 2 at once instead of one? 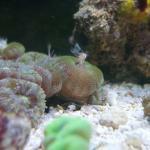 I have a six line wrasse, 4 fire fish, yelow watchman goby paired with a pistol shrimp awesme to watch. My clowns all get along with them.